This title offers heathly eating from South-east Asia with 20 recipes. Features: an inspirational collection of authentic steamed recipes from China, Japan, Indonesia, Malaysia, Burma and Thailand; a mouthwatering selection of dishes includes Spiced Scallops in their Shells, Chicken and Vegetable Bundles, Malaysian Steamed Trout Fillets, Steamed Pork and Water Chestnut Wontons, and Warm Vegetable Salad with Peanut Sauce; expert advice, practical information on tools and equipment, and useful preparation and steaming techniques; over 20 clearly written recipes, beautifully illustrated with more than 100 glorious photographs, including a picture of every finished dish; and plenty of cook's tips and variations provide scope to ring the changes and create your own adaptations, as well as giving useful advice on ingredients. China, Japan and South-east Asia produce some of the world's most exciting cuisines, and they all share a love of steamed food. Steaming food produces an enticing mix of taste, fragrance and texture, which is why it is so popular in Asia, where food is presented and eaten with great attention to detail. Steaming is also extremely healthy - little or no extra fat is added, and the food retains its full nutritional value. Little surprise then that it is now so hugely popular in the rest of the world. 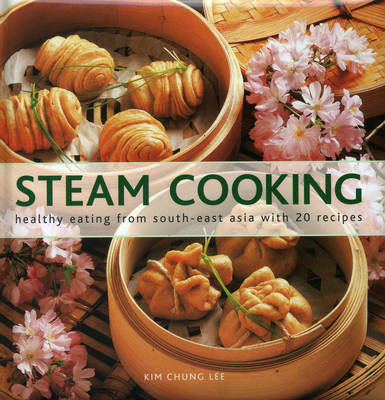 This delightful book brings together a collection of over 20 tantalizing steamed recipes. There are tasty appetizers such as Mini Phoenix Rolls and Aromatic Stuffed Chillies, and delicious main courses such as Sticky Rice Parcels and Pan-steamed Mussels with Thai Herbs. Vegetable side orders include Steamed Morning Glory with Fried Garlic and Shallots, and Vegetables with Chiang Mai Spicy Dip. With practical advice on equipment and techniques, this gorgeous little book will provide endless inspiration.